Urdhva Dhanurasana (Full Wheel). How and why…. For some people, Urdhva Dhanurasana or ‘Full Wheel’ is one of ‘those’ poses. You either love it or fear it. Granted, holding your own body weight and being upside down takes getting used to, but once you have the hang of it, this pose opens up the whole front of the body and can leave you feeling energised and serene at the same time. It also helps to build up confidence and trust within yourself…. Because you’re holding your body weight and you’re upside down! Urdhva Dhanurasana is not just about flexibility – although you’ll need some space in the hips and shoulders to get in to the full expression. It takes upper body strength to come in to the pose and hold it for a length of time, and when you’ve got that strength you can even add on some variations such as push ups to really work on strengthening the upper body! Full wheel can help to counteract bad posture by lengthening out the spine and relieving back pain. 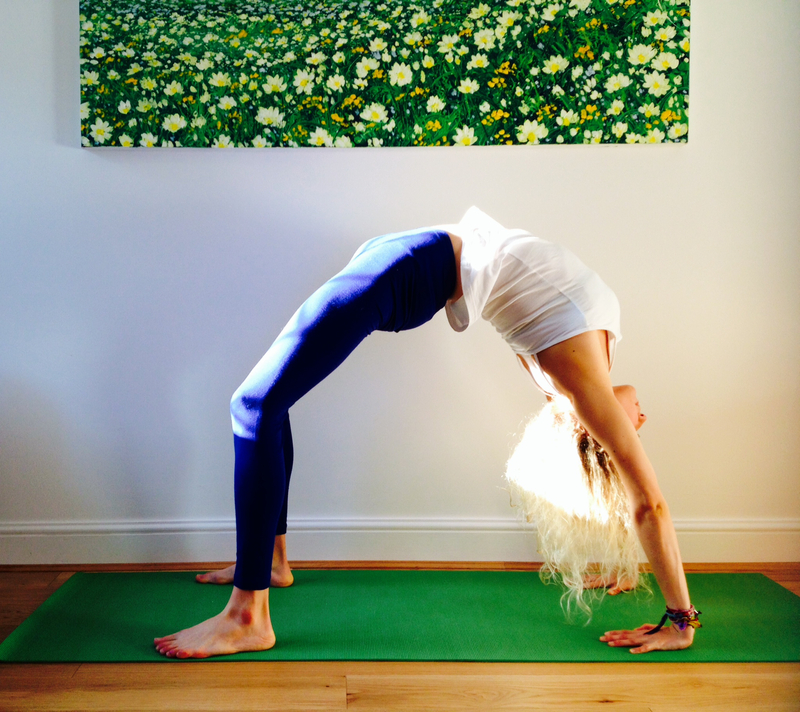 You’ll really strengthen the back muscles, protecting the spine from injury in daily life, and the pose is also wonderful to really wake you up – it’s good to include some sort of backbend in your practice, especially in darker and colder months when we need to boost the energy flow in our systems! Make sure you warm up before coming in to the pose, as this is a pretty strenuous backbend especially if you aren’t used to it. Prepare by moving through some sun salutations which help to warm the body and also include the cobra backbend, and then do a couple of bridge poses to get the back-bending motion going. Begin by lying on your back, with the feet flat to the ground about hip width apart (maybe a little wider to start with), knees bent. Place your hands either side of your ears, fingertips pointing towards the feet. Really ground the feet firmly in to the floor and keep the knees and toes pointing forwards. Inhale and press the hands down firmly. Exhale and push through the feet, lifting the hips. As your hips begin to rise, push through the hands and straighten the arms. Feel a nice even arch throughout the back and an amazing stretch throughout the whole body! Your breath may be a little restricted, so instead of holding the breath, let it become part of the pose. As you inhale, let the breath stretch the whole front of the body, and as you exhale, draw in the abdominals and refine the strength of the pose. To come out, slowly lower down while looking up to the ceiling and lie on your back again. Bring the knees together and take them over to one side of the body and then the other for a gentle supine twist. There will probably be a temptation to hug the knees in a curl in to a little ball here, but resist it! It’s better to do a few twists to neutralise the spine before counter-posing with a gentle forward fold. There you go, practice this and feel your energy levels soar afterwards!